What is a concept map ? While browsing, you will find connections to other images or maps of use to you in developing systemic thinking in courses about the ecological conditions of places, the country or the entire planet. Systemic thinking is the initial step in solving ecological problems. Problem solving is the crucial process in explaining and developing a long term, equitable and sustainable means of protecting people, wildlife and our ecological life support system. Solving problems requires you to develop a concept map, which is a diagram with links between related ideas showing that if one solution is implemented it leads to either another problem, or a larger solution of two or more related problems. An ecosystem is a dynamic concept because, over time, conditions change for a variety of reasons. 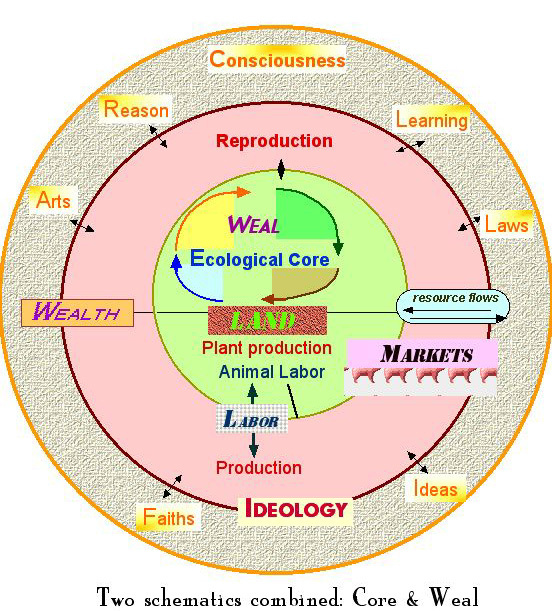 The idea of an ecosystem refers to the necessary conditions for life to thrive. A problem may be defined as: the perceived differences between an existing and a desired state of affairs, or condition. A solution then is a means or practice by which the existing condition may be brought closer to a desired set of affairs or a more desirable condition. Solutions should become part of an action plan , to actually implement viable alternatives, for example go here for some suggested changes in land-use.